1. Water quality in industrial systems. Geochemical source of pollution. Effect of evaporation on concentrations. Effects of poor quality water. Scaling. Fouling. Oil emulsion breakdown. Corrosion. Potable water standards. Agriculture and irrigation. 2. Mathematical modelling of water quality. Mass balances. Mixed and plug flow systems. Systems analysis. Terminal concentration in a water circuit. Application to a mine water circuit. Computer simulation model. 3. Non conservative parameters. Introduction. Basic mass balance equation. Oxygen balance in rivers. Calibration of a moving BOD model. Oxygen balance. Field measurements. 4. Numerical methods. Simulation of hydraulic systems. Numerical methods for the solution of single differential equations. Finite elements. 5. Mass balance of stormwater pollutants. Introduction. Catchment description. Quality observations. Mass balance for event of 18 January 1985 on Hillbrow catchment. Mass balance for event of 7 March 1983 on Montgomery Park catchment. Conclusions. 6. Optimum allocation of water resources subject to quality constraints. Introduction. The system. Solution method. Linear programming solution. The linear programming technique with separable programming applied. 7. Economics of desalination of wastewaters. Introduction. Alternatives for optimal reuse of waste water. Selection of optimum desalination methods. Relevant desalination methods. Cost analysis. Conclusions. 8. Computer analysis justifies desalination. Introduction. Application of optimization of water supply. Systems analysis. Program application. Optimization of mine water system. Result of analysis. Appendices. 9. Integer programming planning of treated wastewater conveyance for artificial recharge of an aquifer. Introduction. Cost analysis. Mathematical formulation. Results. Summary and conclusions. 10. Optimal planning of regional wastewater treatment. Introduction. The mathematical model. Optimization method. 11. Simulation of sewer flow. Introduction. Hydraulic analysis. Flow measurements. Conclusions. Appendix. 12. Sewerage systems management. Learning simulation program. Optimization. Sewer maintenance data processing in Johannesburg. 13. Water quality monitoring networks. Necessity for networks. Monitoring system framework. Factors in network design. Selection of water quality variables to measure. Sampling station location. Sampling frequency. Discussion. Author index. Subject index. 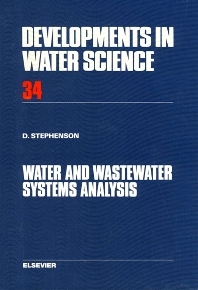 This book provides a sound basis for analysing water supply schemes from the point of view of water quality. A systematic approach to decision making in water resources planning is presented with particular reference to wastewater re-use. Methods for deciding between recycling, purification or use of river water are given. The problems of poor quality water are documented and alternatives suggested, including management in a way to achieve objectives in the most economic manner. Various methods of system simulation and optimization are applied in a number of case studies. Methods of analysis and numerical methods are described, as well as the basis of pollution and water quality. The economics of desalination are also discussed. The examples studied range from regional supplies to internal re-circulation. Groundwater and artificial recharge are considered, and stormwater quality and sewerage systems are also covered. Computer applications exist throughout and a number of simulation and optimization programs in BASIC are presented. The necessity for scientific sampling procedures in monitoring water quality, an often ignored subject, was written by Professor Tom Sanders of Colorado State University. The theory and case studies should prove of value in many aspects of planning the use of water resources with quality constraints. Wastewater re-use and conservation are therefore promoted by the approach adopted.